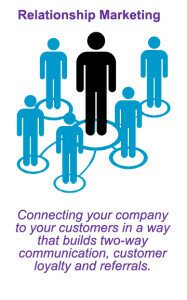 The fine art of developing a personal relationship with each customer is especially difficult for growing businesses. Every day things are happening in the lives of your customers that can influence their desire and ability to remain loyal to your product. Loyal customers are the heartbeat of every company. Without their continued support you are continually spending an extra amount of time and money gaining new customers. Social Media Campaigns invite two-way conversations with your loyal customers, encouraging them to get involved with you in making the world a better place. People naturally respond to caring organizations that are interested in what is happening in the world, and in their lives. Facebook, Twitter, newsletters, blogs, Pinterest and other popular social media provide you with an inexpensive way to stay connected with your customers. We provide exceptional Relationship Marketing by leveraging the various social media on your behalf. Keeping up with all the opportunities for advancing your company’s reputation can take a tremendous amount of time. That’s why it is wise to use CRA as your conduit to maintain timely updates and provide you with the relevant feedback you need. Our services include developing and maintaining continual Facebook advertising, Google AdWords, Constant Contact newsletters, blogs, tweets, RSS feeds, YouTube videos and more. Our goal is to keep you connected to your customers wherever they are, whenever the opportunity arises. We are your one source to simplify the relationship marketing aspect of your marketing plan.